himself as a Scotsman. Rev. Cockran was a big man, reports suggest he stood seven feet tall and weighed about 300 pounds. He studied Christianity at the Church Missionary Society College in England where he learned to become a missionary in a foreign country. He was ordained a Deacon in 1824 and Priest in 1825. He was asked to immigrate to Red River Settlement in 1824 to serve the spiritual needs of the people in the region. He, his wife Anne, and young son, Thomas, sailed from England to North America in the summer of 1825. After a fifty-two day passage across the Atlantic Ocean on the ship, Prince of Wales, they landed at York Factory, Hudson Bay and travelled the waterways south to Red River Settlement. Shortly after arriving, he met Chief Peguis, the legendary Saulteaux leader at Netley Creek. They became good friends, and together developed the settlement of St. Peter’s. Peguis, and his people, were not farmers and at first they opposed a farming settlement, and refused to join Rev. Cockran in his plan to establish it. But as the friendship grew between the two men, and many changes came to Red River Settlement, Peguis agreed to participate in the creation of the settlement. They began cultivating the soil and building houses and schools. In 1836 they built a log church at St. Peter’s although the area was not yet called that. It was then known as the Indian Settlement, because most of the people living there were indigenous peoples of both Saulteaux/Ojibway and Cree heritage.The log church was never given an official name. In addition to his work at St. Peter’s, Rev. Cockran established two churches at St. Andrews. The first, built in 1832 was made of log, and referred to as the “Rapids Church.” The second church, a limestone structure was named the Church of St. Andrew. 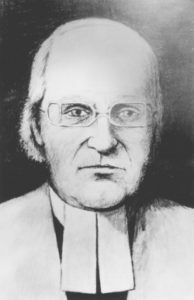 Rev Cockran became an Archdeacon in 1853. He died on 1 October 1865, at the age of 67, in Portage la Prairie (Manitoba). Friends carried his body to St. Andrew’s cemetery for burial, near the front door of the church.